New York/ München. Participatory City: 100 Urban Trends from the BMW Guggenheim Lab, an exhibition summing up the experiences and concepts generated during the two-year run of the BMW Guggenheim Lab, will be presented from October 11, 2013 to January 5, 2014, at the Solomon R. Guggenheim Museum. 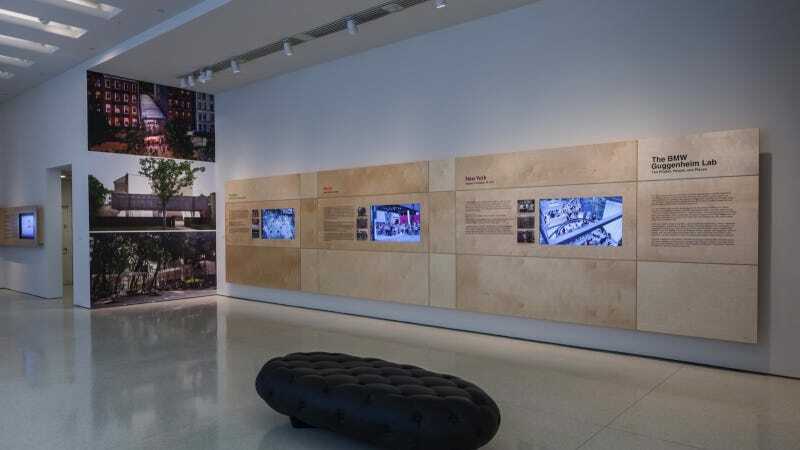 The exhibition is the culmination of the Lab – an urban think tank, community center, and public gathering space – that traveled from New York to Berlin and Mumbai to inspire innovative ideas about urban life and new ways of thinking about cities. Tens of thousands of participants engaged with the Lab’s free public programs, urban projects, and research initiatives, both on-site and online, which informed and helped shape the exhibition. The BMW Guggenheim Lab is a co-initiative of the Solomon R. Guggenheim Foundation and the BMW Group. Participatory City is organized by Maria Nicanor, Curator of the BMW Guggenheim Lab and Associate Curator, Architecture and Urbanism. Participatory City is inspired by 100 of the most talked-about ideas in urban thinking explored at the Labs in New York, Berlin, and Mumbai. The terms, or trends, featured in the exhibition have been selected from 100 Urban Trends: A Glossary of Ideas from the BMW Guggenheim Lab, which includes a total of 300 terms compiled from the three Lab venues. New and old, established and of-the-moment, these terms all relate to the ways we understand, design, and inhabit cities. Each term references a particular Lab event or experience, highlighting participatory programs, tours, talks, workshops, film screenings, and urban research projects offered in each city. Projections of these terms alongside drawings, sketches, and short videos representing the terms will continuously loop on the gallery walls in an all-digital installation. Videos and images from each of the three cities will bring the Labs to life throughout the exhibition. In addition, a global roster of architects, academics, designers, and artists have created digital responses to the 100 Urban Trends, available at www.youtube.com/BMWGuggenheimLab. and the concept of Happy City and psychological well-being in urban environments. Other trends include the 3D Printer revolution that has led to increased Customization; Arduino, hardware developed for operating robots; and urban concepts such as 10,000 Honks, Bottom-Up Urban Engagement, Collective Memory, The New Architect, Eviction, Food Distribution, Gentrification, Infrastructure of Waste and Non-Iconic Architecture, among others. The exhibition also features prototypes of the Water Bench, a project developed during the Mumbai Lab by architect Neville Mars of MARS Architects. Created to address water scarcity and the need for leisure space in Mumbai, the Water Bench collects rainfall for re-use in irrigation and provides public seating. A prototype of the Water Bench is planned for First Park in New York, the original site of the Lab, and six more currently are installed throughout Mumbai. Throughout the run of Participatory City, a series of public programs focusing on a selection of the 100 Urban Trends expand on the issues and projects explored by the BMW Guggenheim Lab. Michael Flowers, Director of Analytics for Mayor Michael Bloomberg’s Office of Policy and Strategic Planning, talks about the role of urban data in New York, and how untapped information and data sets can be harnessed to improve the way the city runs. Charles Montgomery, former Lab Team member and author of Happy City: Transforming Our Lives Through Urban Design, (Farrar, Straus and Giroux, 2013), launches his book and presents fun experiments in trust and play, looking into the striking relationship between the design of our minds and the design of our cities. Neville Mars, architect, founder of Dynamic City Foundation, and former Lab Team member, discusses his interest in design solutions that conserve water and how it led to the creation of the Water Bench, an urban bench that collects rainwater for re-use. Selected by Paul Dallas, organizer of the BMW Guggenheim Lab’s film program in New York in 2011, this series examines the relationship between the urban environment and cinematic storytelling. The series includes films set in the Lab venues of New York, Berlin, and Mumbai as well as other cities around the world including Cairo, Chengdu, Los Angeles, Recife, San Francisco, Tehran, and Vienna. Programs are $7, $5 for members and free for students who RSVP. Films are screened in the New Media Theater, Lower Level and are free with museum admission. For tickets and more information, visit guggenheim.org/bglprograms or call 212 423 3587. A co-initiative of the Solomon R. Guggenheim Foundation and the BMW Group, the BMW Guggenheim Lab launched in New York (August 3 – October 16, 2011) with a focus on the theme “Confronting Comfort;” traveled to Berlin (June 15 – July 29, 2012), with the theme “Making,” emphasizing citizen participation in shaping cities; and finally opened at multiple sites in Mumbai (December 9, 2012 – January 20, 2013), where projects and programs explored the theme of “Privacy.” Participants from more than 160 countries and territories around the world participated in the Lab’s nearly 600 public programs, workshops, lectures, and research and urban projects, both on-site and online. The BMW Guggenheim Lab’s global program concludes with the exhibition Participatory City: 100 Urban Trends from the BMW Guggenheim Lab, on view at the Guggenheim Museum, New York from October 11, 2013 to January 5, 2014. The BMW Guggenheim Lab was curated by Maria Nicanor of the Solomon R. Guggenheim Museum and David van der Leer. The mobile structures for the Lab were designed by the Tokyo architecture firm Atelier Bow-Wow, including a novel carbon-fiber structure used in New York and Berlin and a set of bamboo structures installed at multiple locations in Mumbai. The graphic identity of the Lab, which included an interactive logo, was developed by Seoul-based graphic designers Sulki & Min. Together with Guggenheim curators, three Lab Teams composed of individuals from a variety of disciplines developed programs specific to each city. The project’s blog, Lab | Log, features interviews with BMW Guggenheim Lab contributors and includes coverage of the Lab’s activities. The public is invited to join the BMW Guggenheim Lab’s dedicated social communities on Twitter @BMWGuggLab and #BGLab, Facebook, YouTube, Flickr, and Foursquare, and to subscribe to the Lab's e-newsletter.